There’s No Made Like Home for the Holidays 3 (A three part Christmas Special) | Food It Yourself! First, a quick performance note: The post I made on Sunday night might have been slightly misleading. The dough for Moravian spice cookies is rarely so well behaved. It is usually very crumbly and hard to work. I’m not sure what happened this year- the damp weather, mild temperatures, solar flares- but I’m not complaining. Yes, when you bake from scratch you have to deal with some fickleness from your ingredients. For me, that is part of the fun. 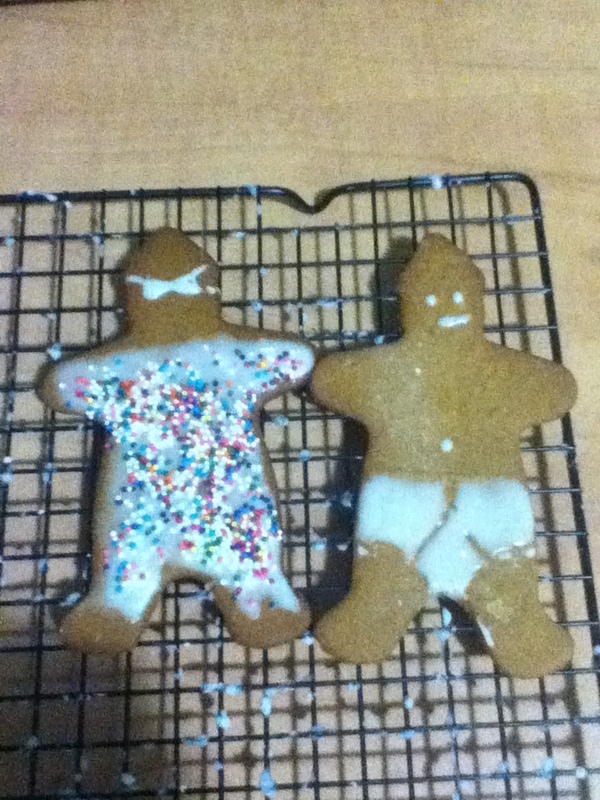 And now, the final movement- we will decorate the cookies. You can be as fancy or as simple as you want. 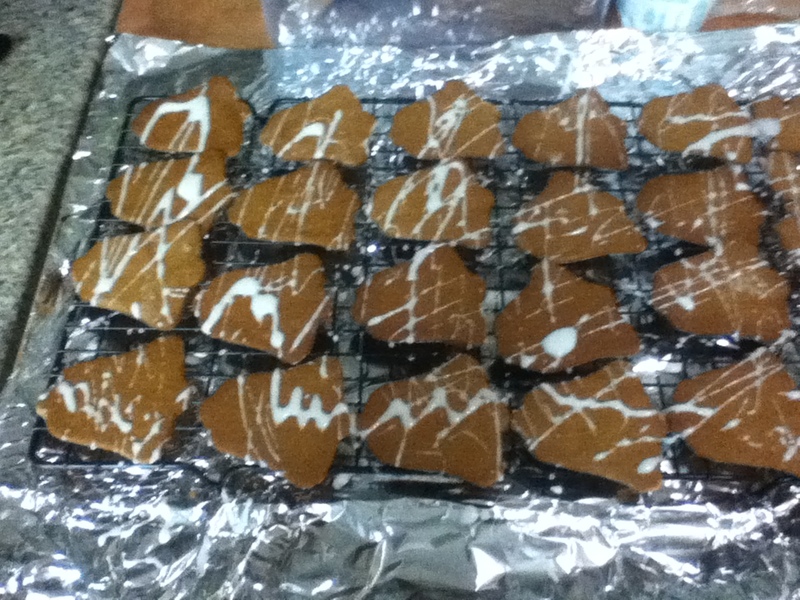 In years when the cookies turn out badly (burn edges, uneven surfaces, etc.) I spend a lot of time decorating. Yes, icing and little candy bits can disguise your baking mistakes. 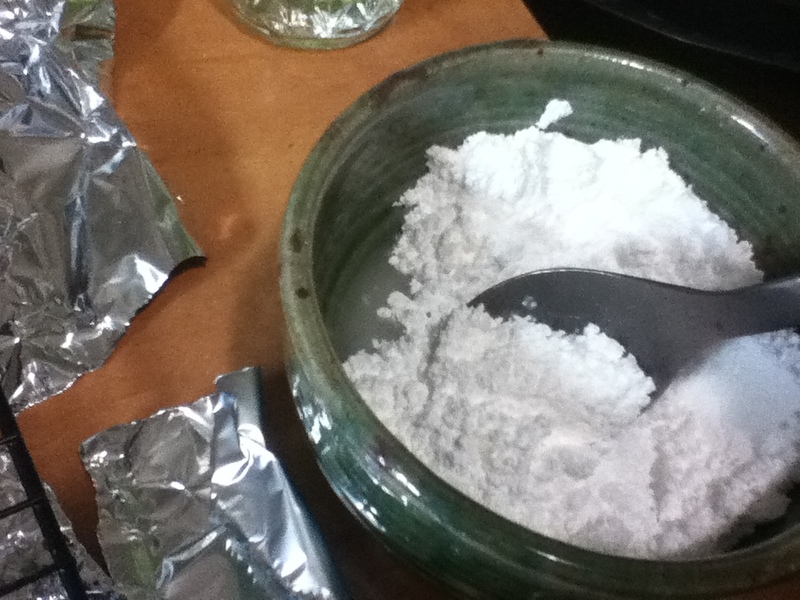 Mix a little water into some powdered sugar. Add the water a little at a time, it doesn’t take much. 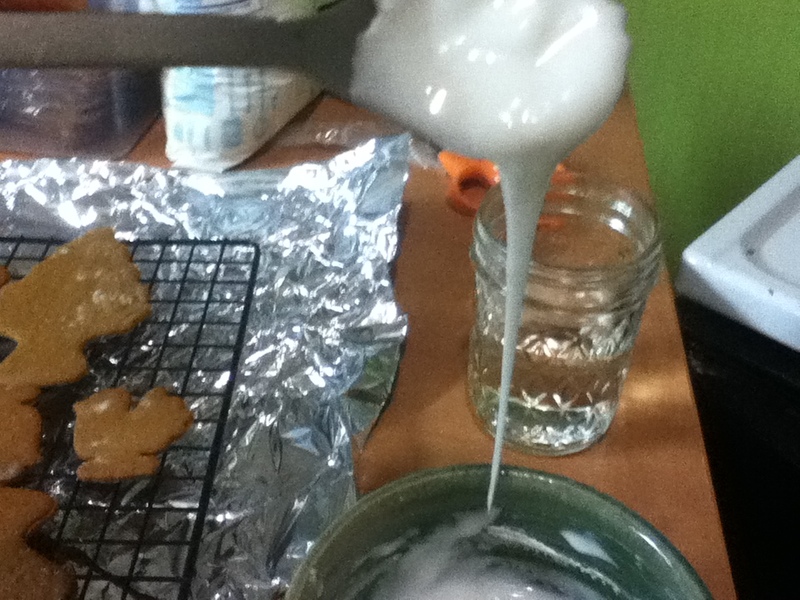 Mix the icing until smooth. It should drizzle in ribbons off the spoon. Line up some cookies on a cooling rack. A sheet of foil or waxed paper under the rack will make clean up easier. Sqiggle and drizzle the icing onto the cookies. There is no wrong way to do it. The uneven lines are part of the fun. If you want a little more flare, spread a thin layer of icing on the cookies and sprinkle with sprinkles. Confectionery Americans require a little more time, but are not difficult. 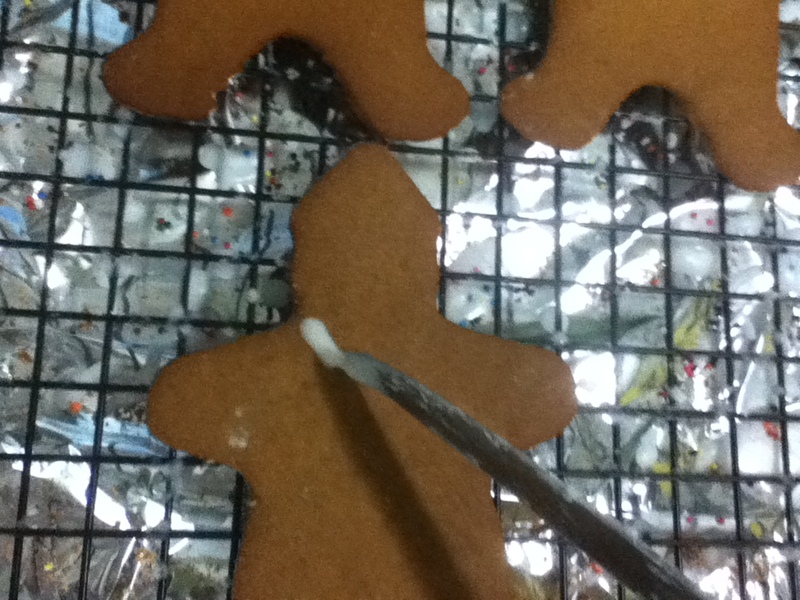 Use a butter knife to make lines on the cookies It’s hard to take pictures while you do it, but just try-you’ll get it. If the lines come out wrong, just scrape them off and start over. Add dots for eyes and little smiles- your Confectionery Americans will reveal their unique personalities. I also managed to catch DJ Sparkle Pants on her way to a club. She was with her buddy Chase. He’s an underwear model. 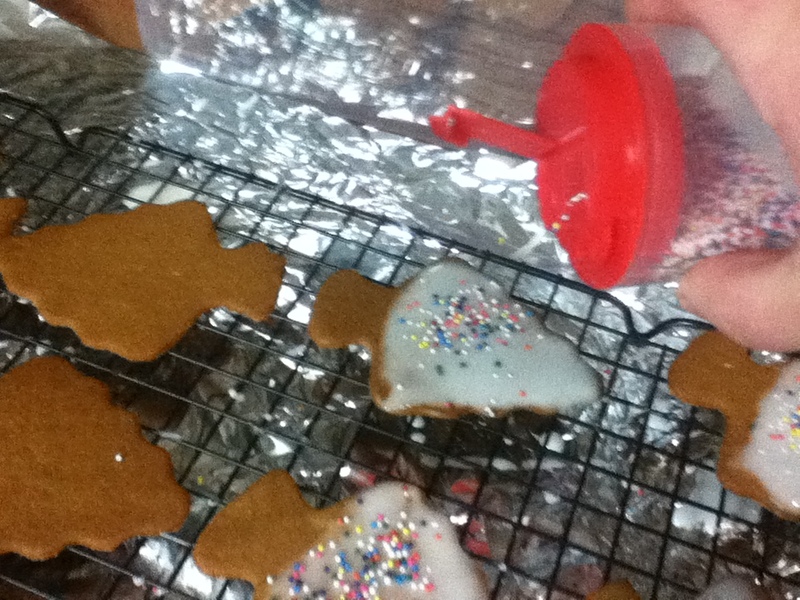 Let the cookies sit undisturbed until the icing is hard, then store in tins or plastic containers. Share them with friends and family. Or strangers! I hope you have enjoyed this Christmas special. I hope it has inspired you to bake from scratch. Buying pre-made dough or using a mix does not make you a bad person. You may even like the way those cookies taste. But please do not think they are the only option you have time for. 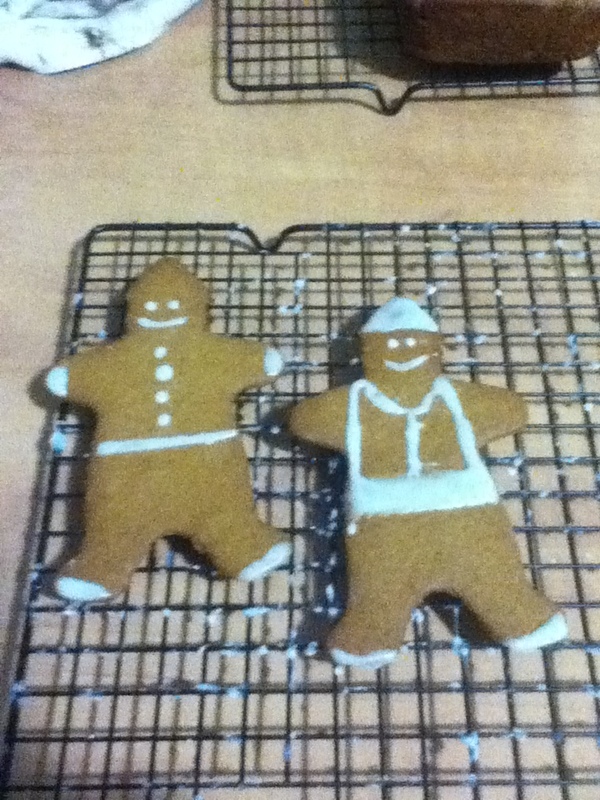 Moravian spice cookies are time consuming to make and decorate, but I made time. There are plenty of cookies that are much faster to make. So give scratch baking a try! You’ll probably have imperfect cookies, but you will also have a lot of fun. Pingback: Cookie Time! | Food It Yourself!